The discipline of Social and Preventive Medicine started, as a part time subject, functioning in State Health Institute (SHI) as "State Medicine" in 1915. On 15th March, 1958, the full time Department of Social & Preventive Medicine was developed and started its functioning in a three room complex in southern side of Administrative Block and was consequently shifted to the new five stories building. 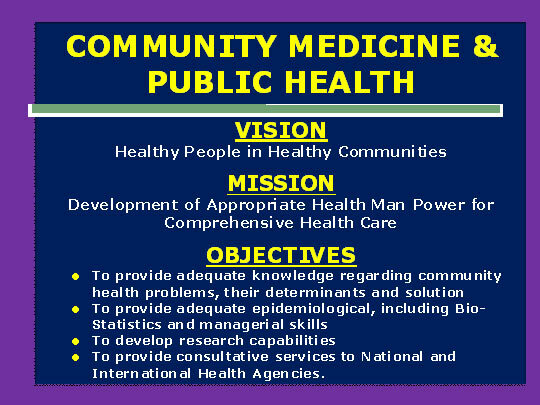 It offers course in Diploma in Public Health for Medical Officers of PMHS, Govt. UP, MD and PhD degrees, IGNOU-PGDMCH and Certificate Course in Health Care Waste Management (CHCWM). In recognition of the excellent work of the department, the Government of India, upgraded the department in 1972. It is a great honour to note that Prof. B.G. Prasad, the first full time Head of the Department has earned recognition and respect for the department not only in the state, but throughout the country and abroad. MD in SPM was started in 1961.This is the second institution in the country to start the Diploma in Public Health (DPH) course in 1963 and the only Upgraded Department of Community Medicine & Public Health in India. Community Medicine Subject is taught to MBBS students from first year to pre final year & later Interns also go through training for two months. The department has four outreach centers, which are being used for training, research, and community health work. Besides teaching in community medicine, the department provides Comprehensive Family Medicine services at 4 health centers attached to it at Sarojini Nagar, Banthra, Mati and Alambagh. These consist of OPDs and inpatient wards at Sarojini Nagar PHC and Experimental Teaching Health Sub Centres (ETHSC) at Mati and Banthra. 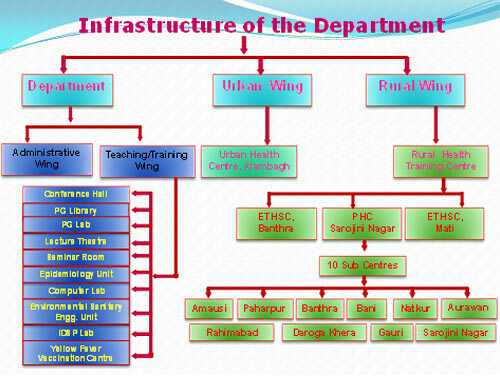 The department was a recognized training centre for in-services training of Medical Officers working in Integrated Child Development Service Scheme of the Department of Social Welfare and nucleus of National Services Scheme of the Ministry of Education, Government of India. The department is also a nodal centre for study on Maternal and Child Nutrition in Uttar Pradesh. 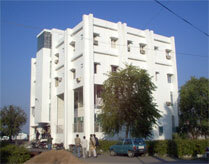 The department has taken over administrative control of Primary Health Centre Sarojini Nagar (PHC) in the year of 2003 and started weekly clinic in Obstetrics & Gynecology and Family Planning in collaboration with the Department of Obstetrics & Gynecology KGMU in addition to routine OPD services , inpatients and field programs. Consultancy services by senior faculty in the field of MCH, Epidemics, HIV Surveillance, Integrated Disease Surveillance Project and other health related activities at International, National and State level. Ratriya Bal Surksha Karyakram, Integrated Management of Neonatal and Childhood Illness, International Classification of Diseases-10, International Classification of Functioning and Disability. National Nutrition Monitoring Bureau UP Unit. Outdoor Clinics: Urban Health Centre, Alambagh, Primary Health Centre Sarojini Nagar and ETHSC of Mati and Banthra. Routine Health Labroratory facilities are also available at these centers. Speciality Clinics of Ophthalmology and Obstetrics & Gynecology are available at PHC Sarojini Nagar. Biweekly MCH Clinic at UHC Alambagh, ETHSC Mati and Banthra. Immunization Clinics at all the four centers attached to department as well as at New OPD Block. Community based Comprehensive Medical Care: to selected group of families at Urban Health centre Alambagh, RHTC Sarojini Nagar, ETHSC Mati & Banthra through mobile clinics as part of Intern training Program. Ambulance services for transportation of patients have been made available and functional. Family Medicine OPD at KGMU. Yellow Fever Vaccination Centre: Thursdays from 10:00 AM to 1:00 PM. The department of Social and Preventive Medicine was established with full time professor, and a Rural Field Practice Area at Sarojini Nagar, 22 Kms. From Lucknow on Kanpur Road. Residential Rural Internship was started at Sarojini Nagar. DPH course was started. Urban Health Center at Alambagh, 8 Kms from KGMU Lucknow was established and additional teaching and field staff recruited. Department has been identified by NACO/UPSACS as Centre of Excellence for STI/RTI Trainings. Yellow Fever Vaccination Centre established. MD Seats increased from seven to ten. Epidemiology, Environmental and Sanitary Engineering Units established. Prof. B.G. Prasad Gold Medal for highest number of marks in the Final Professional Part- I, MBBS Examination. Smt. Sushila Devi Bhatnagar Gold Medal for getting highest marks among girl student in SPM/Community Medicine. Dr. C. Mani Gold Medal for the best work on Rural Health at Rural Health Training Centre, Sarojini Nagar while undergoing training as an Intern in the Department of Community Medicine & Public Health. Rajwanti Rani Harihar Narayan Tickoo Gold Medal for putting up the best Infant Family Study, while undergoing training in the Department passing both Final Professional Part-I and Final Professional Part II examination in first attempt. 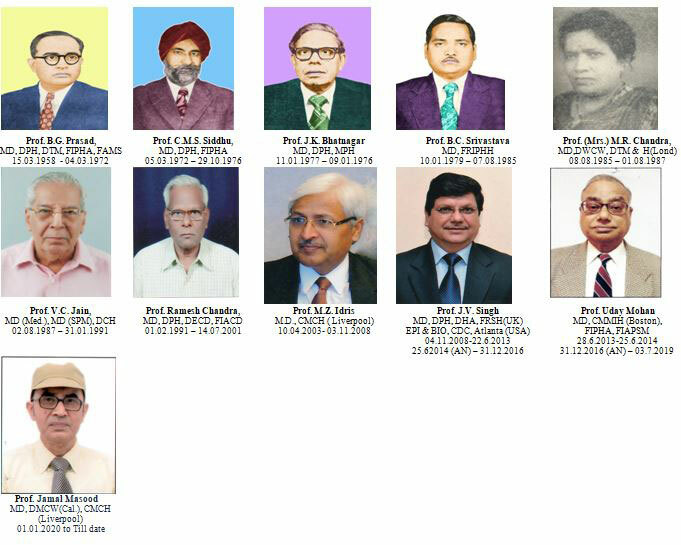 Gold Medal in the memory of (Late) Dr. Pushpa Sharma was instituted by Prof. N.L. Sharma for the best MD candidate in the department on considering the performance in examination and standard of thesis and also passing the MD examination in first attempt. MD Postgraduates Gold Medal in Social & Preventive Medicine instituted in 1967 for the best MD (Social & Preventive Medicine/Community Medicine) students who obtain the degree in the first attempt. Bhagwan Das Wadhwa Memorial Gold Medal in Public Health Administration for Scholars of Diploma in Public Health Part II Examination" who has passed the DPH Part I and DPH Part II examination in the first attempt securing highest total aggregate marks, but not less than 60% marks in Oral and Practical examination of 'Public Health Administration' Sanitary Law and Community Health Organisation. DPH Post Graduate Gold Medal in Community Medicine & Public Health for those scholars who has passed the DPH Part I and Part II examination in the first attempt securing highest total aggregate marks but not less than 60% marks in the total aggregate marks. Prof. J.V. Singh attended workshop on Cohort Harmonization: Development of detailed protocol and study instruments at World Health Organization, Geneva, Switzerland. Prof. J.V. Singh received Best Teacher Award on Teachers Day on 05.09.2012. Dr. Jamal Masood received Best Paper Award at National Conference of IPHA on 11.02.12 at KOCHI Kerala. Dr. Jamal Masood received Bharat Jyoti Award from IIFS on 28.09.2012 at New Delhi. Dr. O.P. Singh received Rajiv Gandhi Excellence Award August 2012 at New Delhi. Dr. O.P. Singh received Bharat Jyoti Award from IIFS on Feb. 2012 at New Delhi. Prof. Reema Kumari working as Additional Proctor in Proctorial Board and Assistant Warden (Provost). Dr. Reema Kumari received Special Recognition Award & Certificate of Excellence for contribution in transforming KGMU into a Regional Model Institution for sound Bio-Medical Waste Management practices and as Programme Incharge IGNOU-CHCWM, UNDP/GEF Global Healthcare waste management Project supported by WHO & HCWH on March,13; received Certificate of Honour "Neera Nursing Home Best IMA Member of the Year Award" from IMA, Lucknow in Oct. 2012; received Certificate of Appreciation" for organizing World Breast Feeding Week 2012" and won the prize of Best Organization Category Breast Feeding Promotion Network of India, New Delhi. Dr. Naim Ahmed elected General Secretary of KGMU Teacher's Association for two consecutive terms i.e. 2007 to 2009 & from 2009 to 2011 and again elected as General Secretary in March 2013. Prof. J.V. Singh appointed as Director, U P Rural Institute of Medical Sciences & Research Saifai, Etawah in 2013 for one year. Organised IAPSM National Conference in February, 2015. Prof. Uday Mohan elected as Vice President of Indian Association of Preventive and Social Medicine in 2015. RBSK, IMNC, F-IMNCI, Routine Immunisation. A full fledged statistical unit with 12 latest configuration computers is fully functional for PG students & faculty. The lab has a IBM Server, internet, network printing facility and latest STATA software for statistical analysis.